The largest online community of Ukrainian geeks, DOU has just published interim results of their ongoing programming languages survey and this is my English translation of its main takeaways and results as of January 2017. The survey was comprised of over 8,100 respondents, and 90% of the participants currently reside and work in Ukraine. Figure 1: What language are you using on your current project? Speaking about preferred technologies, the picture is almost the same, except that Go, Kotlin and TypeScript demonstrate high attractiveness for programmers. When asked about what language they’d choose to use on the project if they were decision makers, fewer developers pointed to Java, compared to the past years. Figure 3: What language would you choose on your project if you could make such a decision? We can hypothesize that Kotlin is a preferred language for those developers that have already faced particular Java limitations. Now let’s review Ukrainian developers’ satisfaction index by their willingness to use the same language for their next project. 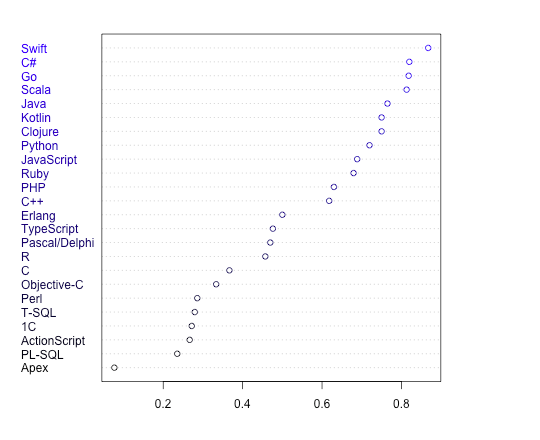 As we can see from the above image, Swift is the most favorite language, followed by C#, Go and Scala. Apex and other SQL and archaic languages are least favorite among Ukrainian software engineers. Speaking about learning new languages, 65% of developers surveyed said they were going to learn at least one new language in 2017. Now let’s see which one tops the list. Figure 5: What language(s) will you learn in 2017? Now let’s see if there’s anything interesting as far as programming language and developer’s age. And there is indeed! Statistics are really surprising and it’s little bit different if compared with 2019′s programming languages.